Pokémon Cards are highly collectible and can be really exciting and fun to collect, trade and play, however once you stray from simply buying the cards from retail stores and venture into buying job lots and individual cards off the internet (on popular auction sites for example) you are highly likely to run into fake Pokémon cards somewhere along the line, trust me - theres a lot of them out there. Some of these fakes are really well made, and at a glance you probably wouldn't know they weren't real. The sad thing is that some of these sellers who are pumping out booster box after booster box of fake cards actually have quite good feedback profiles, as those less vigilant buyers may simply not even stop to think "are these cards genuine", or perhaps they're just a bit too trigger happy on giving feedback, who knows. Anyway, I've put together a little guide, based on my own frustrating, and sometimes mildly amusing acquisitions of fake Pokémon cards I've bought from the internet or had traded to me to help you catch out these dodgy sellers. If you've spotted a deal on eBay for 36 booster packs in a booster box and it's $12 USD, that in itself should be a red flag. But like me you may think it sounds too good to pass up just incase it's someone clearing old stock of legit cards (that would normally cost 6-7x more than that), check the sellers feedback rating first. Yeah sure they might have thousands of positive feedback, 98% of it may even be positive. But check their negative comments and see if any of it contains accusations of fakes. The one positive thing is, should you buy these cards from eBay and report them as being counterfeit eBay will force the seller to refund you if you can substantiate it with actual proof. 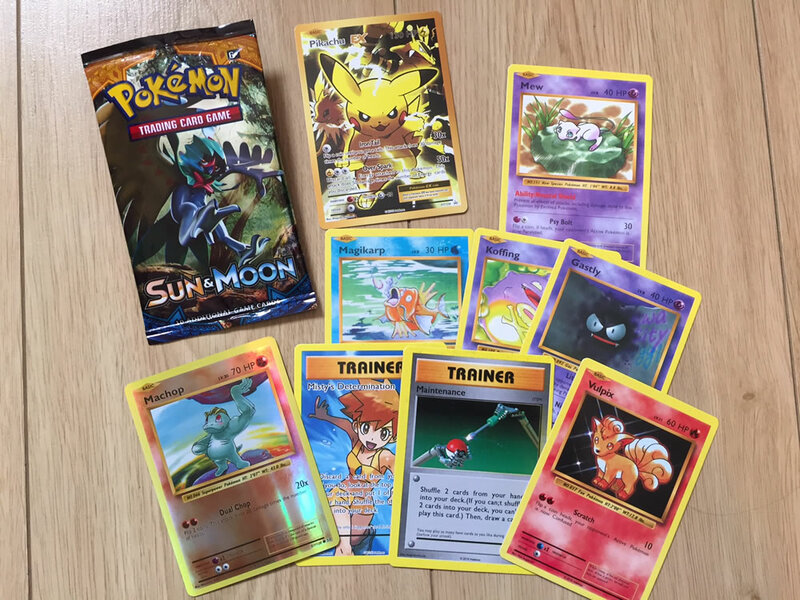 Should you not want the messing about of trying to get your money back however, lets take a look at a listing of fake Pokémon Cards, and show you how to identify them before you buy. So why have I picked on this listing, and what makes me think they're fake? 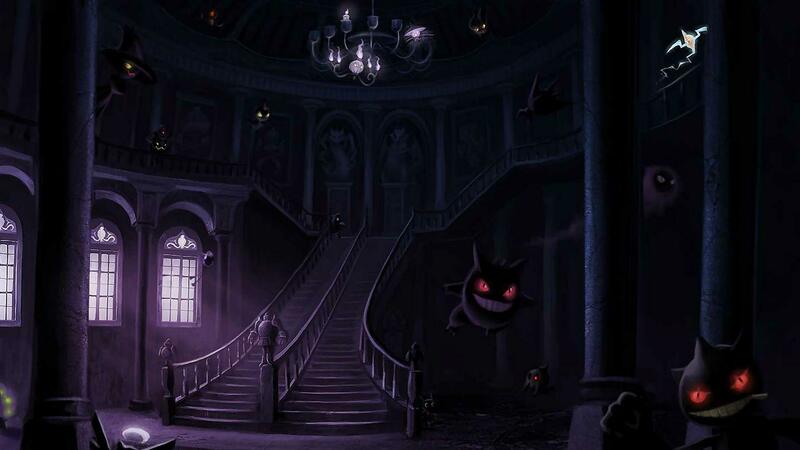 well firstly, look at the image of the booster boxes. Pokemon Go trading cards? At the time I write this there are no such things. So you can see that I've also circled his Free Delivery right? Well great, everyone loves something for free. However it's September 3rd and if I order today they'll be here in 9 days, the slowest domestic UK (where I am) services are 2-3 days, so why would it take 9? Here's the answer: The cards aren't coming from London, they'll be coming from China. 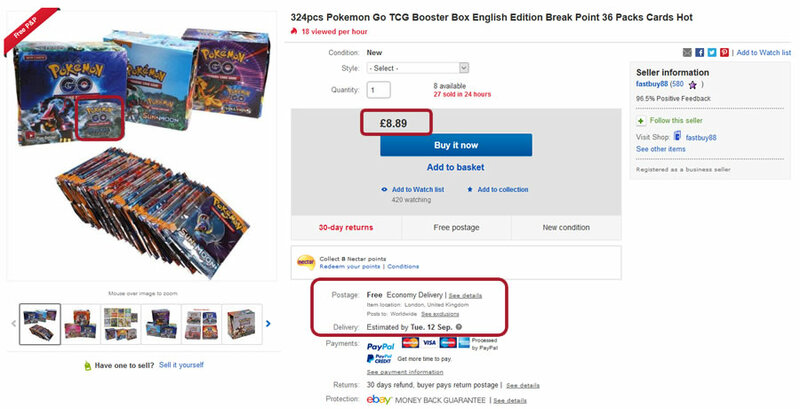 OK and finally I circled the price, a booster box containing 36 packs of Pokémon cards for £8.89 GBP (thats about 12 USD at current exchange rate). Yes, 24pence, or 35 cents per booster pack. I would truly love them to be real, but I'll save you the trouble. They aren't. But he's got 96% positive feedback! you're wrong Luke! they could be real! Check out the below shot from this guys feedback profile, when you select the negatives. I'm not saying don't buy anything off the internet ever, by any means. Just take a look at the bits I mentioned above and think twice before buying. 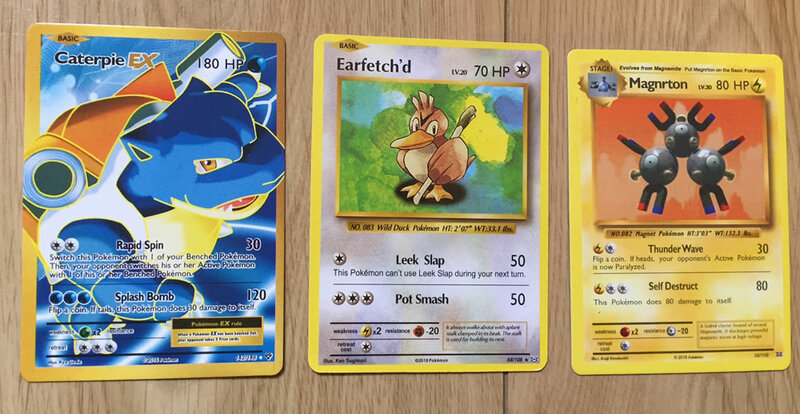 If you have bought some cards you aren't sure about, read on below to find out how to spot fake Pokémon cards and how to tell them apart from real ones. 1. We all know that booster fresh smell when you open a pack of legit Pokémon cards right? It seems one thing these counterfeitters haven't quite mastered is recreating it, many of the fake cards don't smell 'booster fresh' and might smell a bit plasticy/different. I'm proud to say I knew something was wrong with my booster box of Pokémon Steam Siege cards the minute I smelt them. 2. The next one which is an obvious giveaway if you are buying new, sealed boosters as I did is to check for the card which gives you the codes for the Pokémon TCG Online? Not in there? It's because they can't fake those codes, so you may notice you have 9 cards instead of 10 as a result. 3. Place one of the suspect Pokémon cards face down, next to a legit Pokémon card, face down. There is often a suspicious level of plasticy looking shine on the fakes, and although the fakes have got better as the years have gone on, there colours are off. The back of a fake Pokémon card (left), The back of a legit Pokémon card (right). Notice the plastic looking shine on the fake, and that the wrong shade of blue has been used on the border + Pokemon logo outline. 4. The devil is in the detail, and sometimes the devil is quite a lot more obvious than that. Many of these fake Pokémon cards are produced in China/other regions where English is not necessarily the first language. Look for spelling errors on the names, descriptions, typing errors, or downright having the wrong Pokémon's info on it's card. Take a look at the below examples. These are the cards I got from the Pokemon Sun & Moon booster pack I got from eBay. Note: None of these cards are in the Sun & Moon set. NONE. So whats my problem? 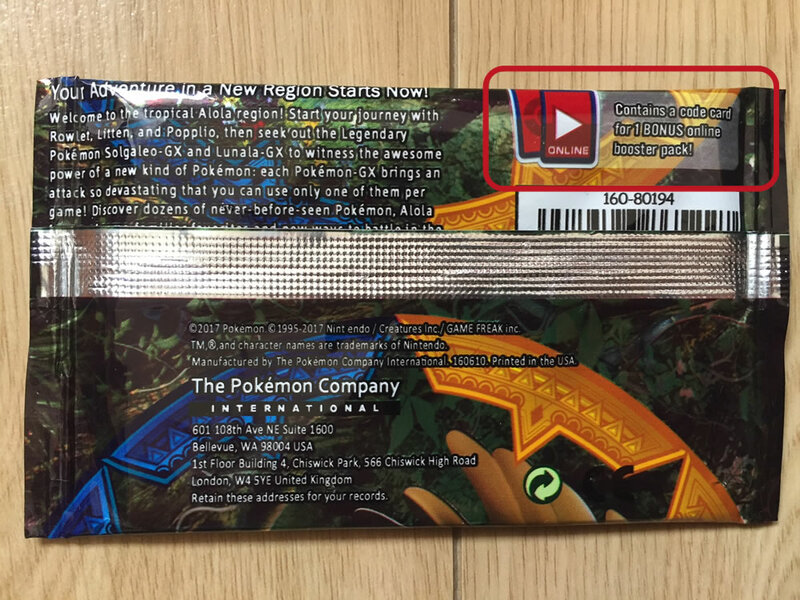 Well for a start as some of you probably know already, none of these cards are from the Pokemon Sun & Moon collection, that aside take a look at the images below: you see the back of the booster pack stating 1 Online TCG code card inside? well there wasn't one. The pack should contain 10 cards as stated on the front of the pack including the code card, theres only 9. These both being relatively small details when compared with the fact that none of these cards relate in any way to Sun & Moon. More often than not, fake boosters will not include the 10th card, as that 10th card is normally a code card for the Pokemon TCG Online. You will never get these TCG Online Card codes from fake booster packs, because the counterfeitters simply can't produce codes out of thin air that will interact with the TCG Online. 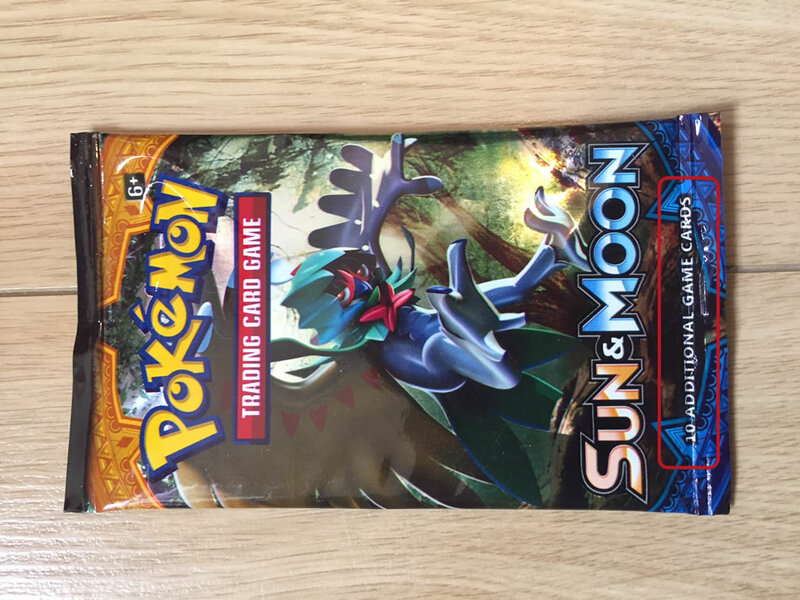 Look at the text on the Pokémon cards, more often than not the font will be completely different on the fakes than on a genuine Pokémon card. If your Pokémon cards FEEL more plastic than card, start to question the pack even more. In the next section we're going to look at purchasing used Pokémon cards from local sellers. 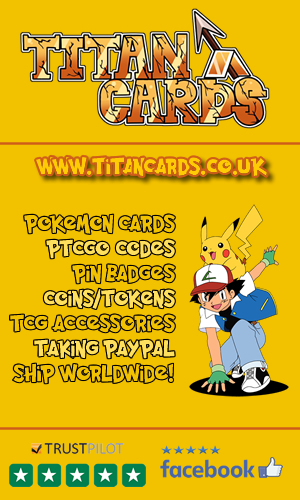 Buying valuable individual Pokémon Cards off eBay, Amazon marketplace/other marketplaces. Or buying job lots from those same places. 1. Hold the card up to the light, if its particularly see through then it's probably not legit, whereas if you hold up an English Pokémon card you know is genuine to the light, barely any light passes through it. There is an exception here with some Japanese cards which are a little more translucent, but this is a good general guide for western/English cards. 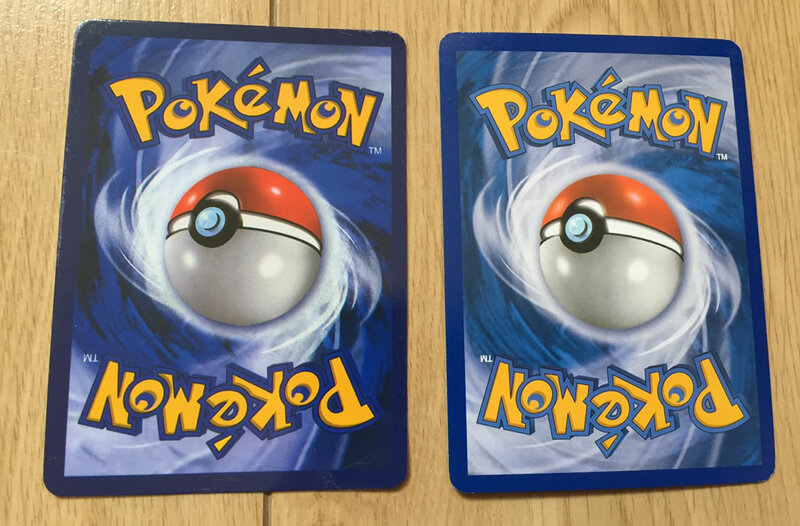 The reason that legit western Pokémon cards don't let much / any light pass through is because they contain a blue/black coat in the centre of the card to prevent that. 2. Identifying suspicious 1st Edition's cards. Some fake Pokémon Cards may once have been real! What the hell am I talking about? 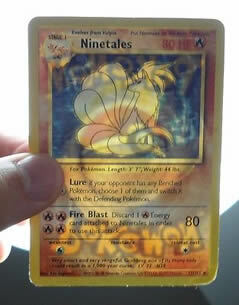 Lets say someone sells you a regular Pokémon Card that they've stuck a 1st Edition stamp on. At a glance it'd probably look quite real, but there are some give aways to look out for. See the picture of the two 1st Edition cards below-right? the one on the right is legit, the one on the left isn't. What makes me say that? Look carefully at the fake on the left. It's a worn, used, very played condition card. Yet the area immediately around the 1st Edition stamp appears to have been cleaned - most likely prior to the stamp even being put on it. Look at the text of 'Edition' itself, the 'E' is the give away for me, though that D's seen better days too... hell, its just not a very good stamping job! No amount of play/wear will warp letters like that. It's been done intentionally. 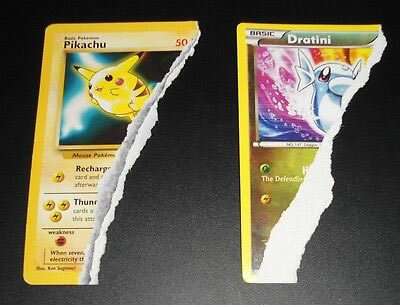 LEFT: Tearing a real Pokémon Card left, a fake on the right. The real card has a light blocking dark bit going through the middle, the fake doesn't. RIGHT: A real first edition card on the right, vs a fake first edition card on the left. 3. If you've paid out good money for a 1st Edition Card and you are 100% convinced it is fake, this video could help you prove it and get your money back. I'd only do it if I was bullet-proof sure though. A guide on How to REMOVE a FAKE 1st Edition STAMP by TCA Gaming on YouTube. The texture of the cards, if you are reasonably experienced at collecting Pokemon Cards, and it doesn't feel quite right... well it probably isnt. And if you get multiple Ultra Rares/Holos in one pack it's most likely fake. They also sometimes use fake artwork on the foil packs. Sometimes these fakers will get a little lazy and use the pack artwork on a GX card. That just about brings us to the end of this guide, and I hope it helps someone out. In the mean time if you can think of any way to spot fake cards that I don't have listed here please get in contact so I can make this guide better & potentially help more people find and report more naughty sellers. Thanks for reading!